According to the organization's website (which, coincidentally, points back to the Wikipedia article about the organization), Diplomatic Mission Peace and Prosperity (DMPP) is an international lobbying organization accredited in the UN, the US, and the EU. The organization was founded by former US Ambassador Richard Holbrooke as a peace mission in the Balkans and around the world. "Diplomatic Mission Peace and Prosperity works for the creation of more powerful lobbies with world personalities in support of Balkans’ democratic developments, of those of the countries under development, according to the UN’s principles and American democracy. The activity of DMPP is extended in Albania, Kosovo, Montenegro, Macedonia, Italy, Israel, Turkey, France, Belgium, USA, South America, Africa, Australia, India, etc." There are several photographs on the Internet showing meetings of DMPP members with world leaders, with the DMPP flag displayed in the background. I have attempted to gif the flag based on those photographs. The flag of Diplomatic Mission Peace and Prosperity features the organization's seal in blue and green centered on a white field. 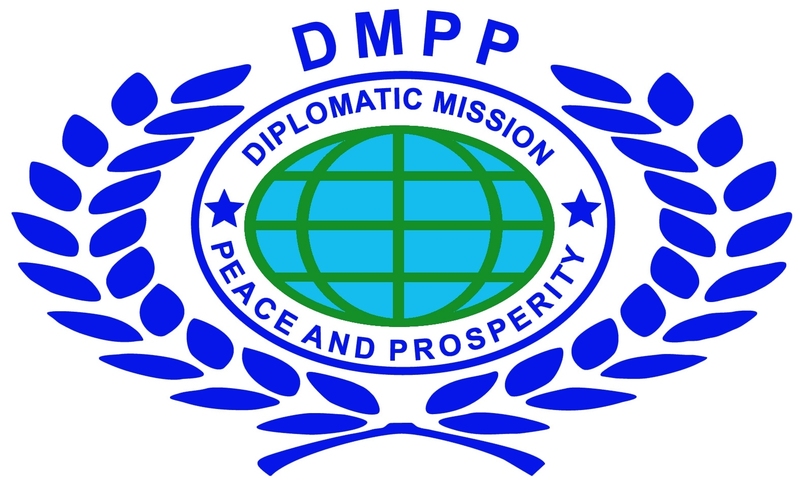 The organization’s logo is a seal-like ellipse (probably a nod to the diplomatic accreditation “oval” used on Embassy cars) flanked by a U.N. style two olive branch wreath, with "DMPP" atop of it, everything in darkest blue. The ellipse is filled with a stylized world map in elliptical projection (no coastline or other contours, only 3 meridians and 3 parallels) in dark green, surrounded with the inscriptions "Diplomatic Mission" arched above and "Peace and Prosperity" arched below separated by 5-pointed stars — these two inscriptions in darker blue, but the stars in darkest blue. All letters are sans-serif capitals. There seems to be a variant flag with sky blue as background in the logo (https://krahu.files.wordpress.com/2015/05/emblema-of-dmpp.jpg and http://www.dmpp.org/images/dmpp_home1.jpg) in the middle, as seen here (fourth flag from left to right): https://diplomaticmission2011.files.wordpress.com/2017/02/img_08361.jpg?w=640 (source: https://diplomaticmission2011.wordpress.com).